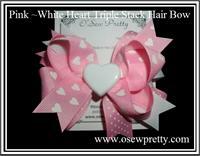 Lots of Heart ribbon stacked just right the embellished with a white heart charm. Available in several colors. 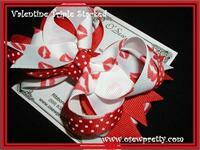 Red, black and white polka dots stacked just right on top of black striped ribbon. 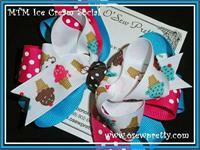 Ice cream cone ribbon mixed with shocking pink polka dot and stacked just right on top of turquoise. Red and white polka dots stacked just right on top of Maize and then accented with a surround a loop Mouse parts ribbon. 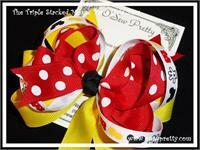 This bow is full of loops and a perfect match to the lady bug clothing line. Available in four sizes. 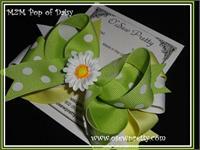 This bow is full of loops and a perfect match to the POP OF DAISY clothing line. Available in three sizes. 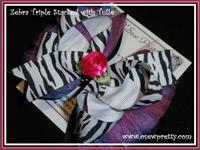 Create you're very own triple stacked hair bow from your choice of three different grosgrain ribbon colors. Then choose your button color and the childs first initial. The possibilities are endless! 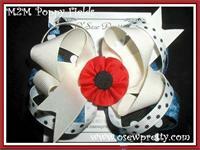 This bow is full of loops and a perfect match to the poppy love clothing line. Available in four sizes. This bow is full of loops and a perfect match to many clothing lines. Available in three sizes. 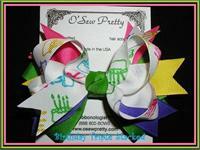 This bow is full of loops and a perfect accent to her Birthday party. Available in three sizes. Red watermelon seed print ribbon stacked just right. 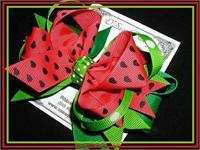 Available in THREE watermelon colors. 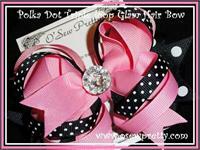 Adorn her with kisses with this Valentine hair bow for your little " SWEET HEART"
Made to match Poodle print accented with shocking pink and black ribbon stacked just right . 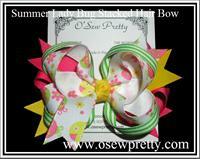 This bow is full of loops with tulle accents..
Made to match spring and summer's newest lines. 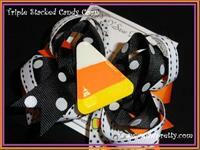 Lots of Festive Halloween ribbon stacked just right then embellished with a special Halloween candy corn charm. 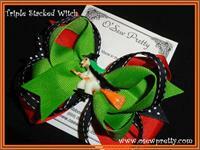 Lots of Festive Halloween ribbon stacked just right then embellished with a special Halloween witch charm. 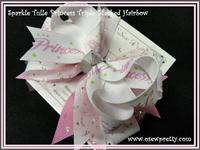 Every little princess love's a Pink hair bow, especially when it has her embroidered initial. 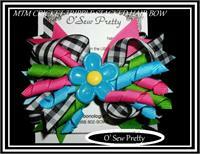 Create you're very own triple stacked hair bow from your choice of three different grosgrain ribbon colors. Then choose your button color and the childs age or first initial. The possibilities are endless! Every little princess love's Polka Dots, especially when it has her embroidered initial. Lots of Wildly cute ribbon stacked just right surrounded by hot pink, and zebra print. Lots of Festive Holiday ribbon stacked just right then embellished with a Gingerbread House charm. 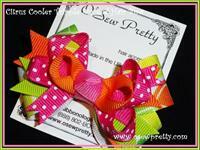 This bright lime and hot pink hair bow is bursting with pizazz! 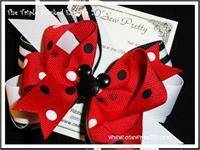 Lots of lady bug ribbon stacked just right then embellished with a lucky lady bug charm. 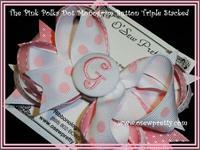 A wonderful combination of pinks and Grey create this fun triple stacked hair bow!